There are 2 requirements for this to work, PowerShell v2.0 has to be enabled in Windows Features so does .NET Framework 2.0, 3.0 and 3.5, these seem to have been already enabled in my testing systems by default, although I have 1 build of Windows 10 where the .NET Framework was not enabled – not sure why yet. 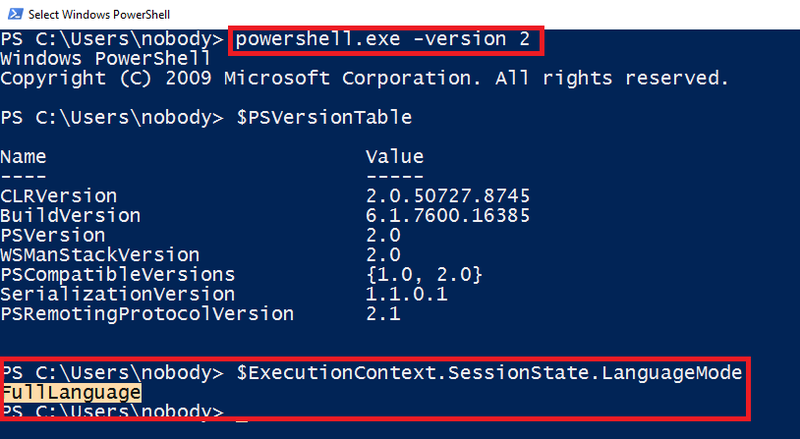 No special access permissions are required, standard user can carry out the bypass and there is no requirement to elevate the PowerShell session. Lots of Red errors, denoting Constrained Language Mode is doing its worst. Another really cool part of this is that Deep Scriptblock logging does not pick up the commands after the PowerShell -Version 2 if the bypass is run from an existing PowerShell session as shown above, however if the bypass is passed as part of a standard type payload.bat like the one shown below, (which is an implant from PoshC2), then nothing is shown in the logs. To replicate this you should get a copy of PoshC2 and edit the payload.bat to add the -Version 2 or -v 2 and then run it and check the Event Viewer – ‘Microsoft/Windows/PowerShell/Operational’ log for signs of activity. Also to state the obvious this bypass method falls apart if either, PowerShell V2.0 or the .NET Framework 2.0, 3.0 & 3.5 Windows features are not enabled, this is were @SubTee’s work will come in very handy. Thanks for reading, see you soon.